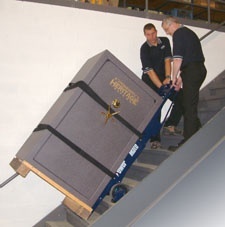 The PowerMate M-2B PowerMate is a powered, heavy duty stair climber with a capacity to move loads up to 1,500 lbs. 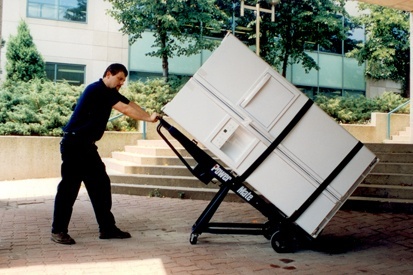 The M-2B has eight inches of extra height to accommodate taller loads like built-in appliances, vending machines, visi coolers, safes, switchgear, commercial hot water tanks and man lifts. 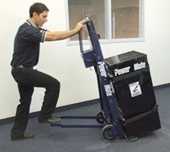 The PowerMate M-2B is four machines in one: a powered stair climber; a powered tailgate lift; a loading dock leveler and a well-balanced dolly. The following list provides a quick reference to some of the advantages attributed to the PowerMate M-2B stair climbing hand truck. Retractable wheels convert the M-2B into a four-wheel dolly which makes flat surface rolling a breeze! Ablility to roll in a completely horizontal position, allowing the machine and load to pass through low doorways with ease! Has a 12v, 32 AH sealed gel maintenance free battery that is leak proof and will last on average from 4-7 years. 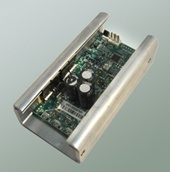 Together with our high-efficiency drive screw design the M-2B will move a 500 lb. load up AND down 20 flights of stairs on a single charge! Our 1-800 number along with our load moving guidelines are prominently displayed on your PowerMate M-2B. Our customer service personnel are always happy to help with on-site support. Every consideration was given to make your PowerMate® the most ergonomically friendly lifting device on the market. For example, all our operator controls are strategically positioned on the top of the machine between the hand grips. 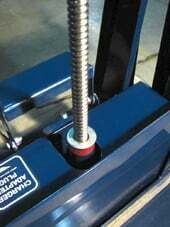 The drive screw brake is always engaged until the operator activates the controls. This safety feature prevents unnecessary load movement. 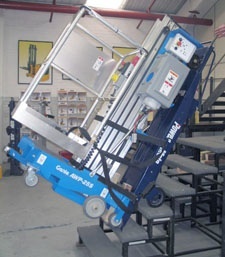 The wheels on a PowerMate® lift up and out of the way reducing the overall footprint of the machine – ideal in a tight spot like narrow stairwells and landings. This feature is also why you are able to break back the load with such relative ease; with the wheels out of the way, the effort to pull the load back onto the wheels is dramatically reduced. 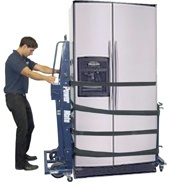 Once the machine and load are back onto the wheels, you are now in a well balanced position - with no effort required to keep the load in balance! You can even let go of the machine at this point! A handy feature on stairwells should you have to open a door or even answer your phone. 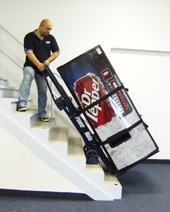 This is impossible with a regular hand truck and is a major advantage in owning a PowerMate®. All PowerMate M-2B's are manufactured with solid state controls which reduce the draw on the battery adding to your daily operational battery life. Another advantage of solid state controls (unique in the industry) is the "soft start" feature. This further increases safety by reducing sudden movements during start up and results in the smoother operation of the machine. The new controls also make servicing and maintenance as easy as 1-2-3! The M-2B comes complete with retractable wheels that convert your PowerMate into a four-wheel dolly for flat surface rolling. 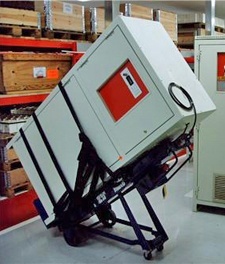 The extra wheels can be deployed and retracted while the machine is loaded. The PowerMate M-2B is the machine of choice for moving commercial hot water heaters. With eight extra inches of height the M-2B has the right amount of leverage to easily move these heavy items. Combined with the Hot Water Tank attachment the M-2b is ideal Hot Water Tank moving package. The TwinLift attachment allows the operator to swivel the load in 360 degrees of arc for perfect and easy product placement. All PowerMate Stair climbers are well balanced dollies. 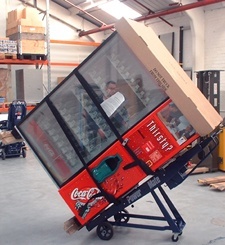 The unique three point balancing design means the operator can step away from the machine temporarily to open doors, move obstacles or even answer their phone! 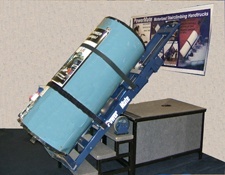 The M-2B comes with a retractable dolly to assist with maneuvering loads on a flat surface. 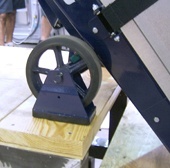 The two retractable wheels can be deployed even when the machine is loaded! The M-2B can come equipped with 14 foot straps, however you can order your PowerMate straps any length you like! Here you see the M-2B delivering a Visi Cooler. 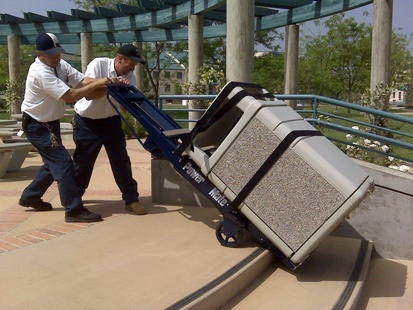 The M-2B is 8 inches taller than the M-1 stair climber making it easier for the operator to maneuver tall loads like built-in appliances or large vending machines. 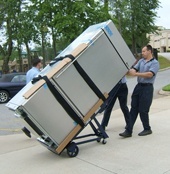 Safe movers love the M-2B because of the extra height and the 1,500 lb. capacity. The PowerMate M-2B Stair Climber comes complete with: two strapbars, one hook bar, one 12V sealed long life battery, a battery cover, one two-wheel retractable dolly, and one battery charger with auto shut-off and multi voltage feature. Hook Box , Cylinder Attachment , Extended Toe Plate Width , Extended Toe Plate Depth , Skid Plate , Face Plate , Wheel Brakes , Big Wheel Attachment , In-Vehicle Battery Charger , Side Handles, TwinLift. 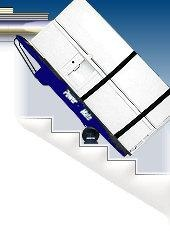 The PowerMate M-2B is our appliance and vending stair climbing hand truck. 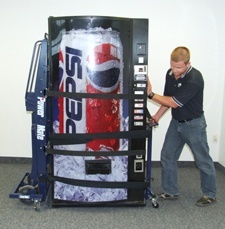 Do you move built-in appliances or large vending machines? Have we got the moving package for you! The TwinLift attaches to your PowerMate and supports the load on all four corners allowing the operator to position the product in the vertical position. Rotate 360 degrees with the Twin Lift's heavy duty casters. The M-2B Big Wheel attachment is the ideal solution for contractors that regularly need to move heavy loads over rough or uneven ground, even snow. The large air filled tires attach and remove easily to the fully loaded M-2B. Also ideal for moving propane cylinders over grass or unpaved shipping yards. 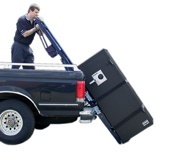 The PowerMate Hook Box can be installed in the bed of your truck, van or loading dock. Your fully loaded PowerMate is designed to work with your hook box to assist with loading heavy loads in our out of your vehicle. The hook box reduces the amount of effort required to hold a load secure while you 'power' lift your load.. The PowerMate charging station is the ideal place to charge and store you PowerMate. Keep all your PowerMate accessories inside. Can be locked for extra security. 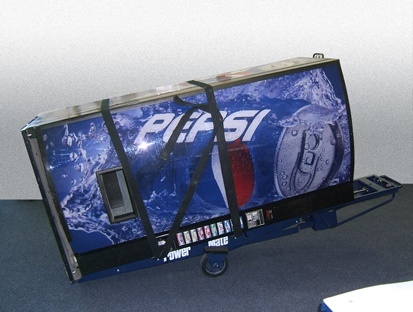 The TwinLift accessory easily attaches to your PowerMate M2-B and allows for flat surface maneuvering of vending machines in the upright position. 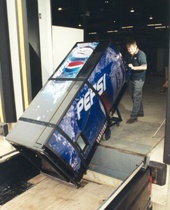 Can be attached or removed while the machine is loaded. The controls on the M-2B are weather protected, sealed switches easily accessible from the hand grips.